The central peaks of this complex crater on Mercury formed in such a way that it resembles a smiling face. This image was taken by NASA's Messenger spacecraft. 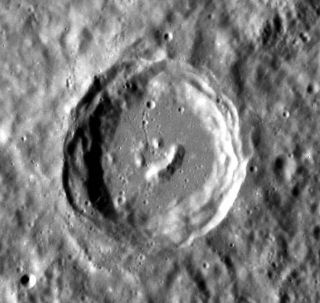 We might not think there's much to smile about on the sun-scorched surface of the planet Mercury, but a happy crater apparently begs to differ. NASA's Messenger spacecraft snapped a photo of a crater that appears to be smiling blissfully up into space. The complex crater's "eyes" and "mouth" are actually fortuitously formed central peaks, researchers said in an image description. NASA featured the photo Monday (Nov. 12) as its image of the day. The smiling crater is an example of a phenomenon called pareidolia, in which the human brain recognizes shapes in random images. Perhaps the most famous pareidolia image is the so-called "Face on Mars" snapped by NASA's Viking 1 orbiter in 1976. The photo actually depicts a giant Martian rock formation with shadows resembling eyes, a nose and a mouth, scientists say. The $446 million Messenger spacecraft (short for MErcury Surface, Space ENvironment, GEochemistry and Ranging) launched in 2004 and took a roundabout route to the solar system's innermost planet. It arrived at Mercury in March 2011, becoming the first probe ever to orbit the tiny, sun-blasted world. On Mercury, photos of odd formations have revealed craters that resemble Cookie Monster, of Sesame Street fame, and Disney icon Mickey Mouse. Messenger's original science mission lasted one year, during which it snapped more than 88,000 pictures of the planet and made millions of measurements with its seven science instruments. The probe is currently embarked on a one-year extended mission, during which it's continuing to gather data on Mercury's composition, magnetic environment and tenuous atmosphere, among other features.